Edward Copeland's Tangents: "It's all true — every word he isn't saying"
"It's all true — every word he isn't saying"
That was the question about Cary Grant throughout his life: gay or straight? This was based, it would seem, on little more than his having shared a house with Randolph Scott in the '30s and having posed for some goofy pictures of the two of them in aprons and frolicking in the pool. Grant was married five times, had some well-publicized affairs, yet the rumors never stopped, and everyone knew about them. Even my parents. In the early 1960s, they had a live album by Allan Sherman, the singing comedian of "Camp Granada" fame. One of the songs was a riff on a mover and shaker having his secretary call various celebrities, and the big ending went: "And then when you reach Cary Grant, tell him I'd love to, but I just…can't." The audience on the album roared; so did my parents. Because there's something about Cary Grant. Whatever he projects at any given moment, he somehow manages to suggest something else at the same time. He's remembered as the epitome of class and style, but with his strange, not-quite-Cockney accent and thick features, he's clearly no aristocrat. In his screwball comedies, he projects anger and a kind of general threat to the other actors. His spills and pratfalls are clearly the result of enormous physical mastery and athleticism. Playing heroes in adventure films, he's a joker and a clown. In love scenes, he's quizzical, wary, amused — anything but ardent. Often his eyes, his smile, the tilt of his head seem to convey something quite different, and usually more intelligent, than the dialogue coming out of his mouth. Which is why Johnnie Aysgarth in Alfred Hitchcock's Suspicion is in many ways the ultimate Cary Grant role. Johnnie is married to Lina, a wealthy spinster from a small English village. He puts the moves on her and they marry quickly, but soon his evasions and subterfuges cause her to have doubts about him. He may have married her for her money (her father thinks so) and be planning to murder her for it too. Or he may be a misguided, misunderstood underdog who's uncomfortably adjusting to life with a woman who has more money than he does. Is he or isn't he guilty, that's what the entire movie is asking. It's not spoiling anything to tell you the ending (he isn't), because it satisfied neither the cast, writers, director, original audiences, or virtually anybody else who has seen the movie since its premiere 70 years ago. Everybody struggled with it during the writing and filming — nobody could come up with the right ending. Because there's no way to resolve this particular story. 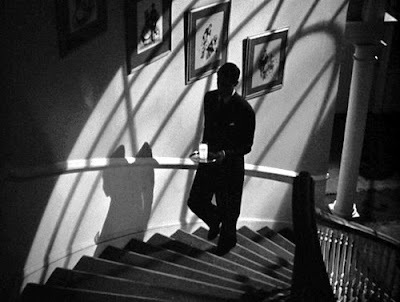 Suspicion is about something inexplicable: Cary Grant's personal ambiguity, his elisions, his ultimate mystery. Grant's real romance in Suspicion isn't with Fontaine anyway — it's with Nigel Bruce as his old friend Gordon Thwaite. Considering his snub nose, he has an inappropriate nickname too: "Beaky." In the 20 years Bruce mumbled and bumbled around Hollywood, he was never more appealing than in this part. Beaky always says the wrong thing and reveals Johnnie's tricks and lies, and then hangs his head as both the angry husband and the offended wife slap him around. Bruce and Grant get a real performance rapport going — they play their relationship as if Beaky was a big overgrown dog and Johnnie his affectionate but exasperated master. When Beaky has a brandy-induced choking fit and Johnnie stops Lina from coming to his aid, Grant is expertly unreadable. Is he frozen with concern, or callous indifference? 70 years later, it's not easy to appreciate what a daring performance this was in 1941. Grant had just come off the greatest string of movies any actor ever had — Topper, The Awful Truth, Bringing Up Baby, Holiday, Gunga Din, Only Angels Have Wings, The Philadelphia Story, His Girl Friday — and was now one of the biggest stars in Hollywood. What was bold of Grant was to take the charm that had brought him to the top and suggest that it might in fact be a cover for any number of repellent qualities. Johnnie is handsome, smooth, and commanding, but he's also a chronic fibber, con man and embezzler... a spider, as the photo at the top suggests. Essentially it's the darkest role Grant ever played. And though the director claimed (probably falsely) that the studio forced it on him, Hitchcock's "happy" ending (as with many of his happy endings) is anything but. Lina blames herself for everything, but she's still married to a man who lies at the drop of the hat and steals money every chance he gets. Johnnie has explained everything away, but he's still married to a woman who knows what he's capable of and shrinks from his touch. Contemplating the future of their relationship is actually the scariest thing about Suspicion. *P.S. : What I've never understood is the need to have Grant to pick a team. Haven't people ever heard of bisexuality?